All my troubles began with a donkey. If it hadn't been for one obstinate, bad-tempered beast, my parents wouldn't have rented me out to a stranger for twenty dollars a year. A Bandit's Tale by Deborah Hopkinson is a delightful middle grades historical novel. It is told in first person from a character that, at first glance, should be an unreliable narrator. However, for all the lies Rocco tells the people he encounters, he is most truthful in the telling of his life. As you know, I don't have a literary background and I liked that at the end of the book the author provided quite a few notes, including a literary term that I had not learned before. A Bandit's Tale is a picaresque novel. A picaresque novel is one where the main character is not an aristocrat. Such stories were first published in Spain around 1600. Typically they are told in first person with an episodic plot. A popular picaresque novel is Oliver Twist by Charles Dickens. The main character in A Bandit's Tale, Rocco, is a poor Italian-borne immigrant. From the opening lines you learn he is sold to a stranger who "rents" young boys (and sometimes girls) to take to the U.S.. The children then are forced to be street musicians, begging on the street corner to bring a dollar back to the Padrone in order to have a filthy place to sleep and a measly bite to eat. Rocco's life is a difficult one, but an adventurous one. I love the chapter titles and that is just the first step into the fun. The language is easy, making the story a quick read. But the way that Rocco relates his first year in New York City immerses the reader in immigrant life in the late 1880s and keeps you turning the page. Sometimes I'm bored by middle grades books. While I can appreciate the stories for their value to the intended audience, I'm usually only mildly entertained. I have to say this was not the case with A Bandit's Tale. I couldn't wait to delve back into Rocco's life each evening. 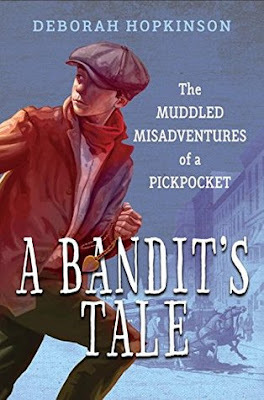 If you are a parent, A Bandit's Tale would make an excellent story to share with your child. Your child won't be the only one begging for one more chapter. Here's my First Chapter First Paragraph post. I don't read many middle-grade books, but this sounds like a story I'd enjoy. My granddaughter is a little too young for this one, but I'll add it to my TBR list for the future. My Tuesday post features Letters From Paris. The opening certainly raised my curiosity. I'd read more. The intro made me smile but the time period isn't a favorite for me. Sounds good. It has been awhile since I've read a middle grade book. I love a good middle grade book AND I have a son who's the right age to possibly enjoy it, too. Thanks for sharing!